The Pirate's Ketch has been serving customers in Punta Gorda, FL since 1984. Both local Interior Designers, and those wanting to decorate their new Florida homes, boats or offices, come to us for unique, nautical and Floridian inspired decor. From hand-crafted stainless steel wall art and paintings by local artists to cast bronze sea-life sculptures and musical clocks, We feature well known local artist Rod Becklund,Mark Malizia, Art Lamay, Gene Rizzo as well as luxurious home Decor from SPI, Deco Breeze, TI New Metal Design, Copper Art and more.The Pirate's Ketch is sure to have something to bring the sun and sea, flora and fauna of beautiful Southwest Florida into your personal environment. 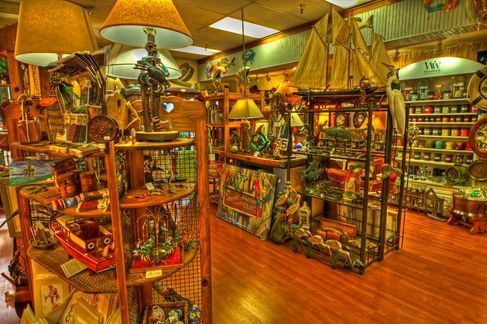 Discover your next treasure by visiting The Pirates Ketch to see these amazing creations and incorporating them into your home, boat or place of business..
Visit us in person at Fishermans Village in the sunny, coastal historical town of Punta Gorda.